XL Dynamics Freshers Walkins From 22nd to 24th June 2016 - Mumbai. 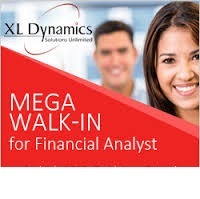 XL Dynamics Freshers Walkins From 22nd to 24th June 2016 - Mumbai. Walkin for Financial Analyst position. XL Dynamics Graduate Walkin Drive. XL Dynamics Jobs for 2013, 2014, 2015 Freshers. Freshers Walkins 2016-2017 At Mumbai. Graduates: Minimum 1 year of work experience is mandatory. Walkin Date: 22nd to 24th June 2016. 0 on: "XL Dynamics Freshers Walkins From 22nd to 24th June 2016 - Mumbai."